At weClean Professional Cleaning Solutions we take pride in everything we do. This includes workplace health & safety. All health & safety training takes place on site when we commence cleaning services at an office or commercial building. We also conduct monthly health & safety meetings to ensure that our teams are reminded about the hazards they may face whilst carrying out their cleaning duties. Our cleaners come into contact with different types of chemicals daily. Most are safe to use without gloves but some chemicals do require the use of some PPE (Personal Protective Equipment) such as – gloves, dust masks, goggles and overalls. All cleaners are trained to use chemicals in a safe manner so that the chemicals do not come into contact with their eyes, skin or that they do not ingest any chemicals. Store chemicals in accordance with suppliers recommendations. Store chemicals away from fire hazards. Ensure your first aid kit is stocked up at all times. Keep a list of emergency contact details at hand. Be aware of the emergency evacuation procedure for the building. Cleaning of flooring can pose a serious risk to those working in the area and others passing through the area being cleaned. Flooring may be wet or equipment may obstruct the walk way. 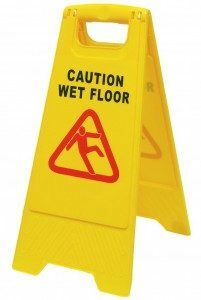 Our cleaners are trained to always use wet floor signs to indicate to others using the walkways of the dangerous wet floors. Cleaners footwear should also be suitable for their working environment with enough grip for working on slippery surfaces. Cleaning equipment should never be left in walkways due to this being a tripping hazard. Loose wiring or bad connections on equipment such as vacuums, floor polishers or deep cleaning machines should always be taken care of before any use of the equipment. Check for damage to any of the equipment. Check that wiring is intact and not loose. Do not put strain on power cables when in use. Keep cleaning equipment such as vacuums clean including filters after use. At weClean our cleaners are only allowed to clean up to a height of 2 metres. In some instances a ladder can be used to clean higher areas. Certain safety guidelines need to be met in order to carry out the cleaning on a ladder. The ladder must be in working condition. Steps must be in good condition with adequate grip. Staff must be trained to use the ladder correctly. In some cases working at height will require supervision and assistance. 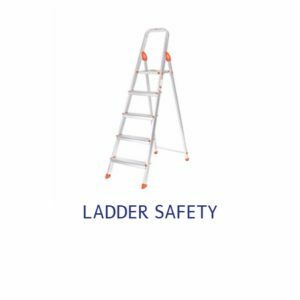 Ladders need to be positioned safely on a stable surface. Only use a ladder for its intended purpose. 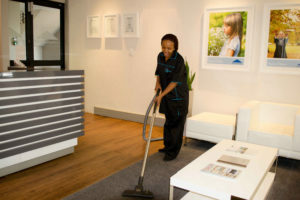 weClean offers Professional Cleaning Solutions in the Cape Town area. Speak to us about your cleaning requirements or about how we can improve your Health & Safety in the cleaning industry.